This version of CCleaner is not compatible with your operating system, veja a versão compatível. Olá internautas do Baixaki!!! É muito raro eu expor meus pontos de vista... Eu formatei meu PC 9 vezes em 2 semanas (parece mentira, "porém é verdade"), graças a programas renomados, um deles que meu PC não vivia sem ele a muito tempo `Advanced System Care`... Eu tenho um PC muito fraco, e tenho que usar Camtasia para manter meu canal no youtube, e também gosto de Jogar CS source online, não obstante percebi depois de muita frustração qual era o problema de tanta lentidão e dor de cabeça :( decidi fazer algumas pesquisas a fundo em relação a integridade do produto (nada agradável)... Enfim, não vou entrar em detalhes. 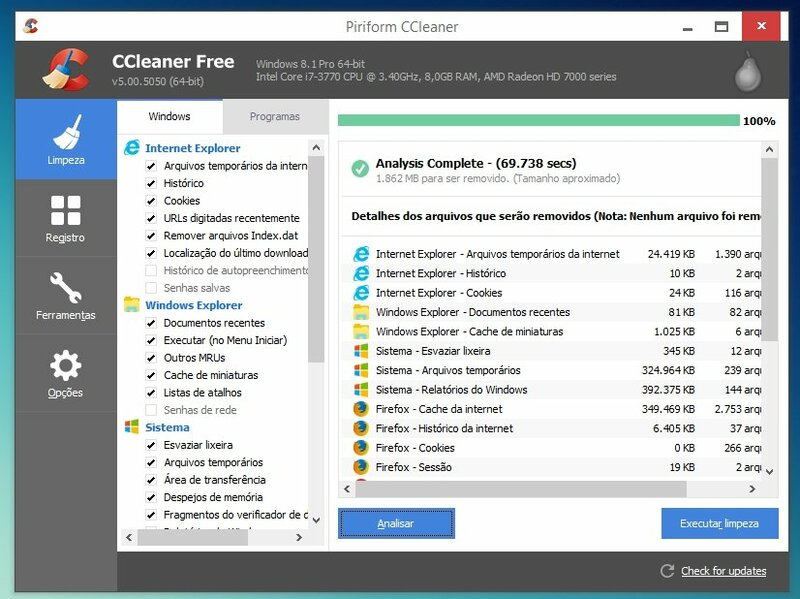 No Site do Baixiki informar sobre o Ccleaner no pros: mantem a integridade do seu pc... "O resto é por sua conta em risco". Eu aconselho para limpeza: Ccleaner, Jetclean e NitroPc, para desfragmentar, o próprio desfragmentador do Windows. Boa Sorte!!! Este é uns dos melhores progamas que removem arquivos desnecessario no seu pc, mais toma cuidado que ele pode exclui coisa que voce não usa a muito tempo mais que voce deixou guardado,mais é só olhar pra que q serve...MELHOR... Contras:um pouco lento. Want to know the premium version of CCleaner? Click here and get a 20% discount! Ah, a new computer ... Whenever we get a machine zeroed we are satisfied with its performance, because any requested task is performed quickly. However, this does not happen over time, not just because the hardware is getting worn out, but also because a lot of stuff has been stored in the PC's memory. Therefore, it is a good idea for the user to periodically clean them and delete files that are not in use, but it is not always possible to do all this effectively, quickly and without headaches - and it is to help in this task that there are programs such as CClenaer. 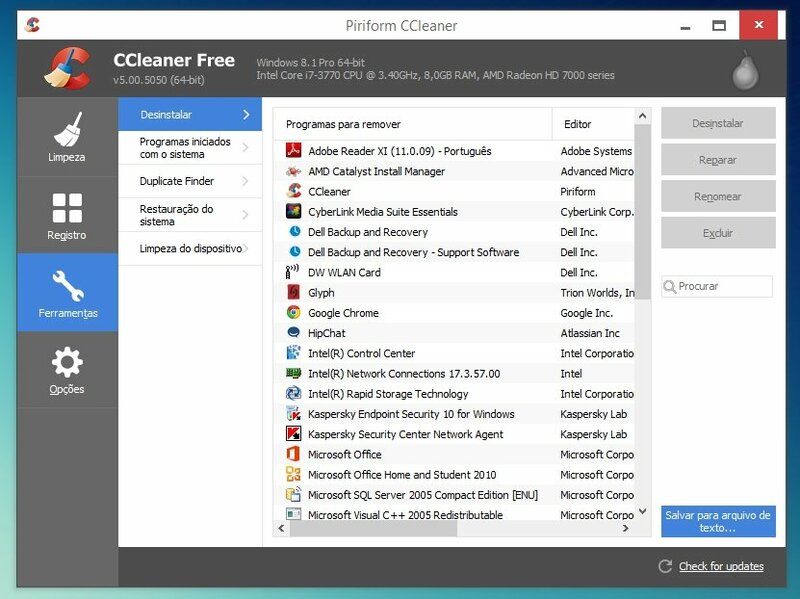 Anyone who has an eye on software and always seeks to extract the best from the computer has certainly heard about CCleaner. The program has just gained a new version, which still has as main feature to analyze various records of the machine (such as system information, browsing cookies, installed and uninstalled program logs, backup data, instant messenger history, among others) and do a complete scan to delete useless files and improve their performance. The Baixaki now has a very nice news for those who enjoy the software available on the site and resolves to buy original licenses of the programs. Through the button located at the top right of the screen you are able to acquire the Professional CCleaner directly from Piriform - a company that has developed the one that is one of the most used cleaners in the world. So do not waste time and enjoy! As in other versions, the main function of CCleaner is still the elimination of unnecessary contents that are maintained by the operating system. As for cleaning, it is performed on both the Windows features and the dirt maintained by other software that is installed on the machine. The program can also identify programs that are installed on the machine so you can manage them in a practical and hassle-free way. They appear separated into categories like programs started with the operating system (it is even possible to define which ones will continue to run along with loading Windows), and there is even the possibility to see the restore points already created - which are extremely useful if something goes wrong with the computer. Operating system logs are also in the list of things that CCleaner can help keep in order as it is able to check them and make corrections to what is not working the way it should. With regard to browsers, the program offers the opportunity to manage the plugins installed in them, and the maintenance of cookies is done intelligently, avoiding headaches and loss of data such as emails already typed, saved passwords and other information. In this version of CCleaner, the main change is in the visual, which now becomes cleaner compared to that seen in previous editions. However, the layout of the menus and other information is still the same as you are accustomed to seeing, so as not to impact those who were already accustomed to the software. According to the manufacturer of the program, the full version should be available by the end of November, and then we will have a better idea of what this new version of CCleaner is capable of doing. During our tests, CCleaner performed the requested tasks without any problems - as might be expected from a version that, at least for now, only had its visual altered. Both the registry fixes and cleanup procedures were performed quickly, taking no more than thirty seconds between scans and other processes. The computer used for testing had 45 GB of your total storage space occupied, so this time can vary more or less depending on how hard your machine is. Another thing that counts in favor of the program is that in addition to showing where the problems are, CCleaner also indicates exactly what will be scrambled so you know what changes the program is making and has time to create a registry backup before leave everything off. There is even the possibility to activate the system monitoring, something that was added with the update 4.18.4844. However, keep in mind that this is a feature that will only work completely for those who purchase the paid version of the program (action that will certainly also unlock other functions of the software). As for the look of the program, the repainted one really made CCleaner look better, since the classic "buttons" (or boxes with some of the information) were replaced by simpler menus, making it look a bit more modern and even close to what's seen in Windows 10. It's the same program you're used to seeing. We can say that what was already good was even better, without doubt. CCleaner is the best option for you to remove useless files and to leave your PC with new breath.